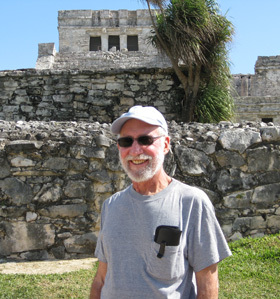 It was the trip of a lifetime – actually 3 trips in one, since the experiences were so different in the Inca region, the rainforest, and the coastal desert. We loved it all but these were unanticipated pleasures. We especially recommend the Larco Museum in Lima and the museum of Pre-Columbian Art in Cusco for their elegant coverage of pre-Inca materials. We hadn’t expected the Islas Ballestas to be so magnificent. We are glad we dropped by there on our way back from Nasca. 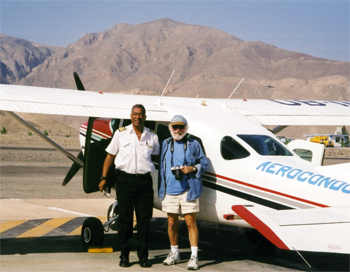 In the arid desert of Peru, California Native founder, Lee Klein, and Peruvian pilot return from another flight over the ancient Nazca lines. 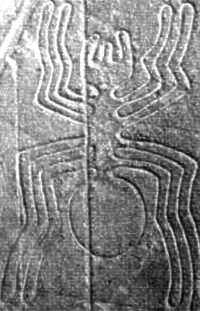 The giant figures and geometric patterns were unknown in the modern world until they were spotted by aircraft in the 1930's. As our Cessna again circled over the giant figures on the ground I shot the final slide on my roll of film and, leaning at a 45 degree angle, attempted to reload my camera. Another pass over a monkey larger than a football field and we headed back to the dirt landing strip on Peru’s Nazca Desert. This was my first trip to Nazca, and the year was 1979. The Nazca Desert is a high arid plateau which stretches 37 miles between the towns of Nazca and Palpa in southern Peru. 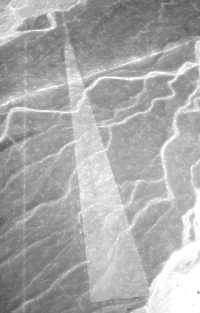 Hundreds of square miles of this dry, rocky plain are marked with lines, triangles and other geometric shapes, some running for more than five miles in a straight line. There are also giant drawings including a monkey, a spider, birds, reptiles, and whales. A giant spider the size of half a football field sprawls on the Nazca Plain. The desert markings, believed to have been made thousands of years ago, made little impression on occasional travelers who viewed them from ground level, but when they were spotted by aircraft in the 1930’s they caught the world’s attention. They have since been surveyed, mapped and studied. Only two questions remain—who made them, and why? In his 1968 book, “Chariots of the Gods,” Swiss writer Eric von Daniken suggested that the lines were built by “ancient astronauts” as a landing field. Looking at the lines from the sky they do resemble an airport, but it doesn’t seem reasonable that advanced extraterrestrial spacecraft would require landing strips. Besides, Nazca’s soft, sandy soil is hardly suitable for an airport. Forgetting the “Twilight Zone” theories, we can imagine a more down to earth explanation. We know that the region has been inhabited for thousands of years—by the Paracas, 900–200 BC, by the Nazcas, 200 BC–600 AD, and by others. The figures are generally attributed to the Nazcas since they resemble those on Nazca pottery. From the sky, this wedged shape figure at Nazca resembles a landing strip. But why create figures which can be seen only from the sky? A reasonable explanation is that they were not intended to be viewed by humans but by gods. A local school teacher in the area explained his theory to me. The lines all point toward the Andes—the source of the water which flows into the area through underground aquifers. The figures, he believed, represent the bounty made possible by this water. The Indians probably conducted rituals on these giant drawings to thank the gods and ensure that the water would continue to flow. They created the lines that extend for miles by placing two stakes in a row, sighting along them to place a third stake, then repeating the process. By moving the desert’s stones and scraping its surface coating, in the absence of rain, the lines have survived the centuries. Hopefully, they will survive many more centuries for future generations to marvel at. Not far from the lines is the ancient Nazca cemetery at Chauchilla. The Nazcas buried their dead, along with many of their possessions, in underground vaults lined with mud bricks. The bodies were dressed in embroidered cotton clothes, placed in a fetal position, and coated with resin. The hot, dry climate mummified the bodies. Over the centuries the tombs were looted by huaqueros, grave robbers, who located the chambers by sticking poles into the ground. On my first visit to the site, the scene was of a desolate desert, pockmarked with holes, and littered with human skulls and bones, broken pottery, with colored designs still vivid on their surfaces, and strands of mummy-cloth blowing in the wind. No other person was there except for the Peruvian school teacher, who was my guide, and two German tourists. While the Peruvian and I talked, the Germans were busy stuffing skulls into their backpacks for souvenirs. Now, more than thirty years later, things are different at the ancient cemetery. The desecrated graves are roped off and trails lead to observation kiosks where mummies and artifacts are displayed. The two German tourists would no longer be able to take a long-deceased Nazcan home with them. 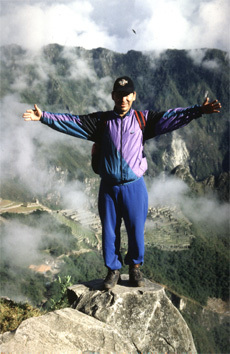 A Peruvian guide stands on a rock overlooking Machu Picchu at the end of the Inca Trail. Machu Picchu cannot be adequately described. 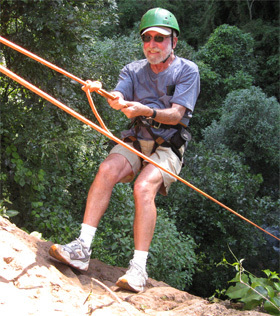 One has to experience it, and trekking the trail heightens the anticipation like a good story. The Sun Gate sunrise experience was shrouded in clouds yet for me, it did not matter. What mattered to me at that moment was the euphoria of restored health and energy and the sense of real accomplishment. 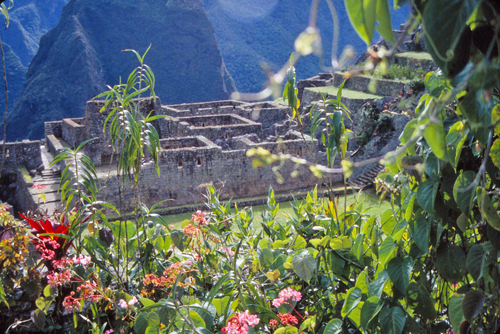 Machu Picchu’s capacity to evoke the power of imagination not only offsets the “Inca Travail” it supercedes it. This to me is the true testimony of its potency. 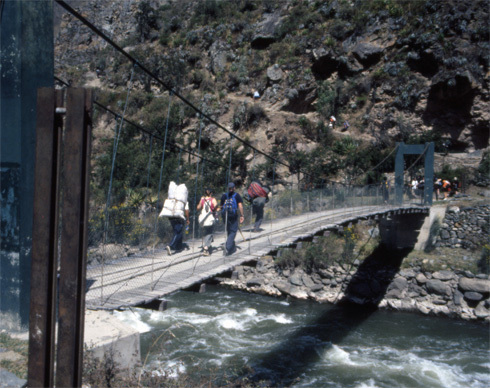 This footbridge over the Urubamba River is the start of the four-day trek on the Inca Trail to Machu Picchu. 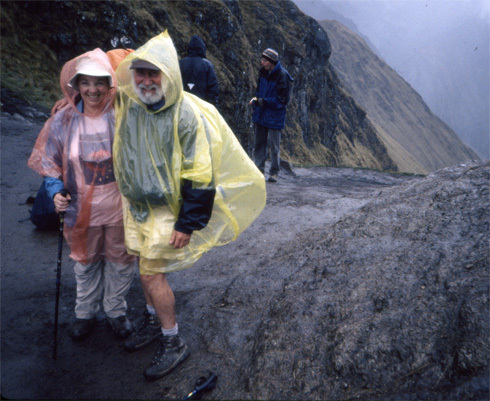 A little rain feels good at “Dead Woman’s Pass,” at 13,860 feet, the highest point on the Inca Trail to Machu Picchu. At the cathedral in Lima, Peru, this mummy was mistakenly displayed for almost a century as the remains of Francisco Pizarro. I first visited the Cathedral in Lima, Peru, in 1979, and saw the mummy of Francisco Pizarro. The mummy had been placed there back in 1891, when Peruvian officials, wanting to prominently display the “Founder of Lima,” had the body moved from the chapel in which it had lain for the previous 350 years. Francisco Pizarro died a violent death. On June 16,1541, while he was having dinner in his governor’s palace, a group of men, led by the son of his ex-partner, Diego de Almagro, broke in and stabbed him to death. As he lay dying from multiple sword wounds, he drew a cross on the ground in his own blood, kissing it, and crying “Jesus.” In 1892, his mummy was exhumed and displayed for almost a century in the Lima, Peru Cathedral, but was discovered to be an imposter when the underground crypt was discovered. After the bloody conquest of the Incas, where 2000 Indians were slaughtered and Emperor Atahuallpa strangled, Pizarro alienated his partner, Almagro. This eventually led to armed conflict between the former partners, and Pizarro’s brother, Hernando, having Almagro garroted. 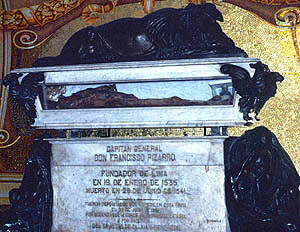 The skull in the lead box matched the headless skeleton and, when reunited, turned out to be a man approximately the right age and height for Pizarro at the time of his death. Additionally, the skeleton showed that the man had been murdered by multiple sword thrusts, unlike the mummy which, upon reexamination, showed no wounds, leading Peruvian and American scientists to conclude that the skeleton was indeed that of Pizarro. It is now believed that the mummy who had sat in for Pizarro for so many years, was a church official. He is now retired, and the “real” Pizarro’s bones have taken his place on display. The world is a fascinating collage of cultures, each with its own traditions, customs and history, which gives them a uniqueness and sets them apart from all of the others. But the more we travel the more we find that so many things are the same and we are more united by our similarities than divided by our differences. In our series, Images of the World, we group our similarities to enjoy them and appreciate their cultural differences. 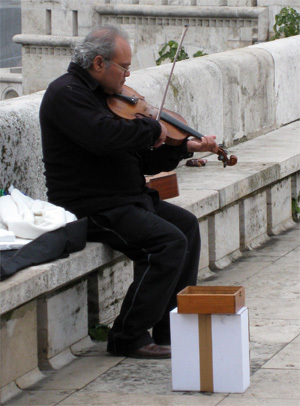 The Street Musicians: No matter where you are in the world, everyone enjoys music, and entertainment provided by street musicians is universal. 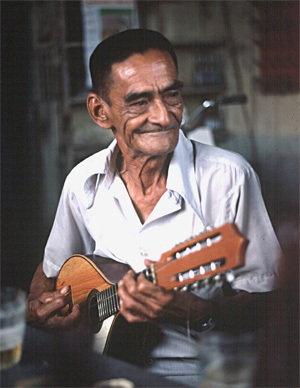 In Iquitos, Peru, a musician plays huayno music, the traditional music of the Andes, on his mandolin. 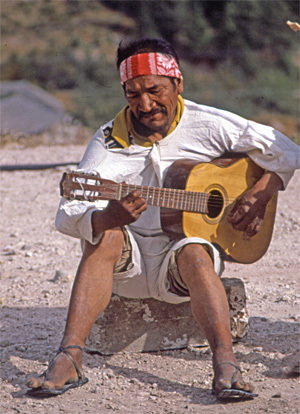 A Tarahumara musician, in Mexico’s Copper Canyon, plays guitar for visitors. 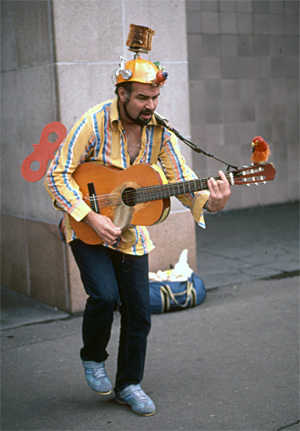 In Sydney, Australia, a colorful street-musician entertains passers-by. A street violinist plays on a Budapest bridge on the Danube River. 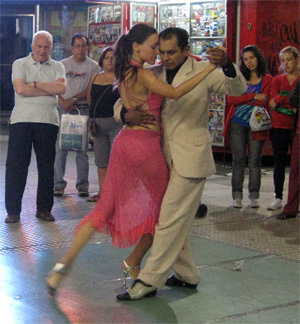 In Argentina, the tango is extremely popular, and in Buenos Aires, Argentina’s capital, street music takes the form of tango dancing. 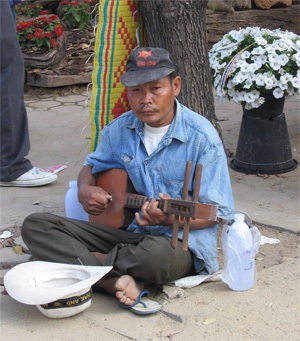 In Chiang Mai, Thailand, a street musician entertains at the annual flower festival. 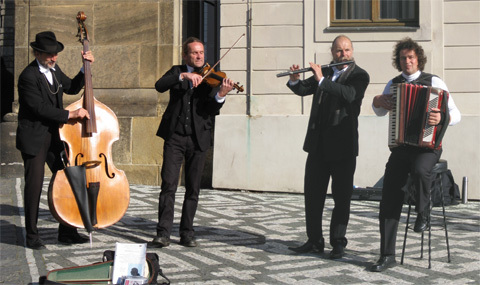 A Street quartet plays classical music outside of the Prague Castle in the Czech Republic. The huge stone ruins of Ollantaytambo in Peru's Sacred Valley stand as silent witnesses to the bloody battles which took place here five centuries ago between the Incas and the invading Spaniards. Standing guard over the Urubamba Valley, the Sacred Valley of the Incas, Ollantaytambo’s great terraces and massive stoneworks served as a ceremonial center and fortress, protecting the heart of the Incan empire from its enemies. Its massive structures were crafted by moving giant stones for miles using sheer manpower and ingenious engineering devices. The builders even re-channeled a river to allow the giant stones to be maneuvered across. 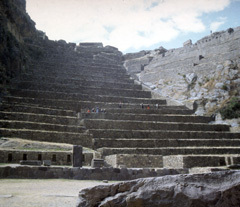 It was here at Ollantaytambo that the Incas staged their last victory over the Spanish. In 1536, the Inca ruler Manco Inca led a rebellion against the Spanish invaders. To quell the rebellion, Francisco Pizarro dispatched his younger brother, Hernando, to Ollantaytambo to capture Manco. With a force of 70 cavalry, 30 foot soldiers, and a “large contingent of native auxiliaries,” the confident Spaniards planned a dawn attack to surprise the sleeping Indians, but it didn’t work. The Spaniards were overwhelmed by showers of arrows, spears and boulders, which rained down from the high terraces above the city. Then, by diverting the Patachanca River through previously dug channels, the Incas flooded the plains below the fortress, and the bewildered Spaniards found themselves mired in mud and water up to their horses’ bellies. They had no choice but to retreat. Pizarro returned, this time with four times the force. The city fell but Manco escaped. Two years later Pizarro captured Manco’s sister and, when Manco refused to negotiate, had her stripped naked, flogged, and shot to death with arrows. 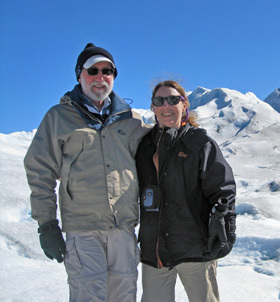 He then had her body tied to a raft and floated down the Urubamba River. Pizarro was not a guy to mess with! After landing at Cusco Peru‘s two-mile high airport, we are greeted by colorfully-dressed Incas who hand us cups of hot tea. 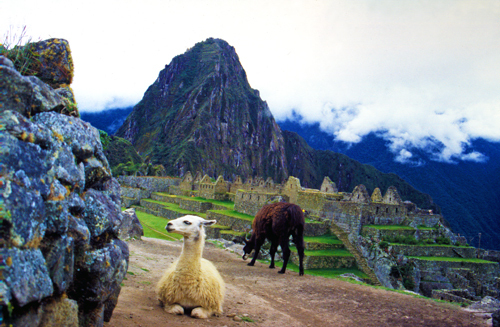 “¡Bienvenidos a Cusco!” A delightful welcome to the former center of the Incan Empire. 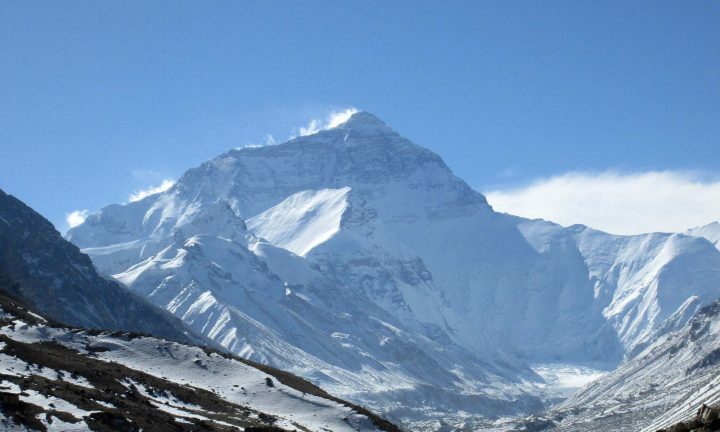 but the tea also serves an important purpose—the prevention of altitude sickness. The tea we are offered at the airport, and again in our hotel lobby, is mate de coca—brewed from leaves of the coca plant. Coca is best known to North Americans as the source of the drug cocaine, which is actually a highly processed derivative of the coca leaf. Because of its association with the drug, coca is banned in the U.S. In the Andes, where it is legal, coca is an age-old tonic and a remedy for many ailments. It enhances mood, without dependency or toxicity; is a natural energizer, similar to coffee; is rich in vitamins and minerals; relieves dizziness, headaches and stomach problems; and aids in weight loss and child-birth. Coca leaves can be chewed, brewed, smoked, or made into candy and baked goods. Shamans in the Andes smoke it for “magical” purposes—to enter the spirit world and to prognosticate the future in the tea leaves. In the Incan empire, coca was considered to be very special, sometimes magical, and its use was controlled. After the conquest, the Catholic Church tried to forbid it, because of its ties to the old religion, but they found that in the high altitude without the coca, the natives had trouble working the fields and mining the gold, so the church itself cultivated the plants and distributed the leaves to the workers. The world’s most popular coca product is Coca Cola™. Made from the extract of coca leaves mixed with kola nuts, it was created in 1885, and sold as a tonic. Coca Cola™ did contain cocaine (commonly used in 19th century patent medicines) until 1929! When it became known that cocaine was potentially harmful, the company had a problem. If it removed the coca from its recipe, could it still call its product Coca Cola™? On the other hand, if it did not remove the cocaine, there could be a boycott of the drink. Their solution was to devise an extraction process in which the coca leaves were ground, mixed with sawdust, soaked in bicarbonate of soda, percolated with toluene, and steam blasted. The result was then mixed with powdered kola nuts and pasteurized—preserving the taste while eliminating the drug effects. Pepsi™, by the way, does not use coca leaves in its recipe! 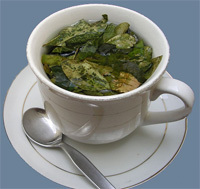 Today there are opponents and supporters of coca, but for visitors to Peru and other Andean countries, the tasty coca tea is a harmless antidote to the ills of altitude. In Peru, It’ Time to Chug Chicha! Have a thirst for a real native experience? While traveling in Peru, stop at a house displaying a red flag on a long pole. 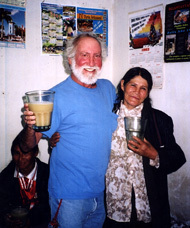 There you can join the locals in a glass of chicha, an ancient Andean drink made from fermented corn. The strange-tasting drink, yellowish in color with a bubbly froth, is served warm for just a few coins, and is quite strong. It is not usually found in restaurants (a similar drink, chicha morada, made from blue corn, is sweet and sold everywhere like a soft-drink), but is sold by individuals, usually in the lower socioeconomic bracket, who have passed down the traditional recipes since pre-Inca times. Recently, in the mountaintop city of Cerro Baul in southern Peru, archeologists from the University of Chicago unearthed remains of an ancient brewery dating back to the Wari Empire (AD 600-1000). It is believed that the brewery was used to produce massive amounts of chicha, which was used both for ritual purposes and festivities. The ruins indicate that the last gathering at this brewery ended with a ritual burning of the entire facility. As the Wari’s threw their cups into the fire, the beams and thatched roof collapsed, leaving what was underneath in very good condition. Scientists have found remains of fire pits and fifteen-gallon ceramic vats. The first step in preparing the chicha is boiling the fruits and grains (now corn) with water. After boiling, the liquid is transferred to fermenting jars and is ready in two weeks. It must be consumed soon after—it does not have a shelf life! So, join your Peruvian neighbors in a glass of chicha, if you dare, and carry on the ancient tradition. There is also a musical form called chicha, inspired by the drink, but more on that in another post.